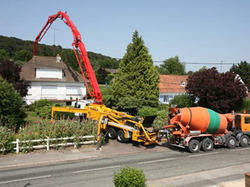 Our range of products include concrete pump rental services. We are supported by a sophisticated infrastructural facility that is furnished with the advanced tools and machinery. We have divided our infrastructure into different sub-units such as quality testing, manufacturing, production, research and development, procurement and warehousing & packaging. This sophisticated infrastructural unit helps us in manufacturing these products in line with the set international quality standards.